no grains | Finding delight. I successfully completed my third (!) Whole 30 *thunderous applause* and thought, my not talk about it a bit on the interwebz. You can read everything I ate during my very first round HERE. But today, I wanna talk about the foods that I have to have in order to make it through. If you’re wanting to undertake your own Whole 30 (read up on it, first and foremost), give these foods a shot! However, I think what’s super great about the Whole 30 process is you really learn what foods feel best for you personally. So experiment and have fun! Potato and sweet potato latkes/home fries/hash browns – honestly do you even NEED bread when you can have a latke?? For more Whole30 food diaries CLICK HERE. I’ll be honest, week 3 I kinda felt like I was eating like a crazy person. Not a lot of variety — Lunches consisted of salads and deli meat roll ups with a rotating set of accompaniments. Dinner was spaghetti 3 nights and smoked sausage for 2. And there was a heavy reliance on Lara bars. But the truth of the matter is, I was BUSY. Several days of week 3 were spent working extra long hours with meal times either squeezed in or at odd hours. So I’m proud of myself for sticking with it…even if the food I ate wasn’t super exciting. All in all, I’m still feeling great! I’m starting to plan my reintroduction phase and form a vision of what I want my diet to look like once this is all over. But more on that later! Whole30 advises to be mindful of snacking and consider eating larger meals instead of eating in between meals (especially if you have binge eating tendencies). Because I lead a pretty active lifestyle (exercise daily and side hustle at a store where I’m pretty much always on my feet running around and sometimes hefting heavy crates of wine) and prefer not to eat huge amounts at a time, I’m staying A-OK with snacking! Prior to the Whole30, Chet and I were already accustomed to eating at home (or prepared at home and taken on-the-go) for every single meal (unless we were traveling). This made adopting the program a million times easier than I think it would be for folks who eat out or purchase convenience foods for the majority of their meals. I’ll report back on Day 29 with Week 4!!! We’re in the home stretch! Week 2 was leaps and bounds more enjoyable than week 1 as my body felt fully settled in to eating this way. Whereas last week I would eat and then feel hungry less than an hour later, this week food felt like fuel. And days 12-14 I started to see a glimmer of the “Tiger Blood” everyone talks about (ie. super-duper energy, productivity, strength, etc.). Especially yesterday when I felt extremely motivated to clean(?) and my workout felt AH-mazing (I was sweating bullets while simultaneously thinking, “I could do this ALL day!”). I’ve continued to have no gastro-intestinal issues. No bloating, no stomach aches. And since Day 3 or 4 (when I was still detoxing from sugar), I haven’t had any headaches. *knocks on wood like whoa* I’ll be interested in seeing if I get any headaches during the re-introduction phase. I’ve always assumed my headaches were due to allergies, hormones, and barometric pressure. But now I’m wondering if they could sometimes be caused by foods?! We are proud owners of an air fryer which is basically a kitchen gadget with powers akin to witchcraft and can make foods taste deliciously unhealthy with mere heat and AIR. (Highly, HIGHLY recommend.) When listing foods like coated fish, fries, tater tots, and seared scallops – they’ve been prepared in the air fryer. I’ll report back on Day 22 with Week 3!!! Wish me luck! Greetings from Day 8 of the Whole30! Weirdly enough, I’ve wanted to try my hand at a Whole30 for some time now. On our recent mini vacay to Delray, I finally convinced Chet to commit to the program with me…and the rest as they say is history. We did a bunch of research, bought a bunch of compliant food, and dove in head first the following the Monday. 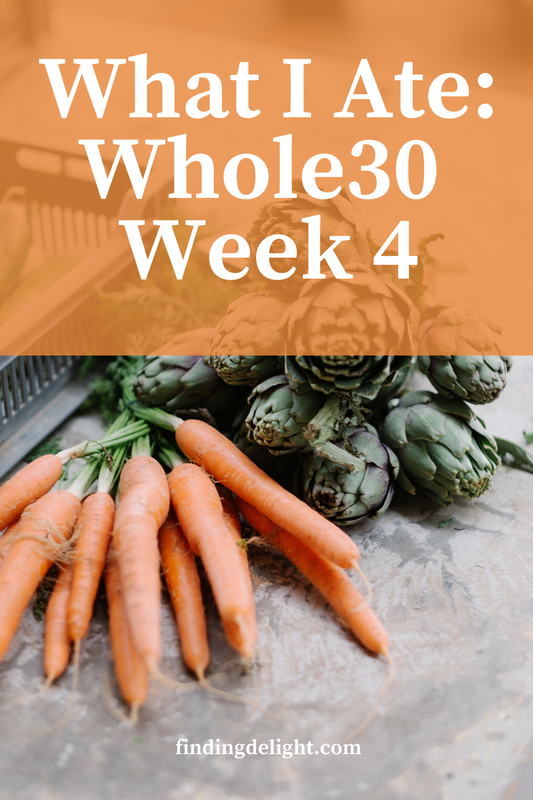 For those of you unfamiliar, Whole30 is a 30 day program that has you cut sugar, grains, dairy, legumes, and alcohol to help you identify if certain foods are having a negative impact on your health and fitness. The elimination lets your body heal and recover from whatever effects those foods may be causing. So what’s left after cutting all those foods? Well, the program encourages you to eat all sorts of WHOLE foods – like vegetables, fruits, meats, and eggs. Essentially, I think calling it a “diet” is kind of a misnomer. You can eat as much as you want to feel full and good. You just have to eliminate certain foods and drinks. Throughout the first week, I didn’t really experience any severe cravings or food boredom and I chalk this up to having a bunch of compliant foods on hand. However, as of this writing (Day 8), I could really go for a baked good or some crackers of some sort. But I’m not gonna cave…I wanna see what sort of benefits the next week has in store! I’ll report back on Day 15 with Week 2!!! Wish me luck!